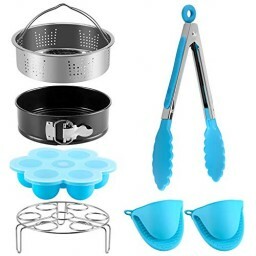 【7-Piece Accessories Set With Instant】 The 7 pieces accessories set with Instant is a essential accessory kit to your kitchen,includes:1 Steamer Basket，1 stainless steel egg steam trivet, 1 Non-stick Springform Pan, 1 Silicone Egg Bites Molds, 1 stainless steel kitchen tong,1 Pair Silicone Cooking Pot Mitts . 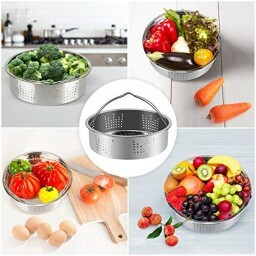 【Food-grade Material】 Steamer basket, Springform pan, Egg steamer rack, Egg beater are use food-grade 304 stainless steel material, it has a much higher temperature resistance, the other silicon parts are also made of high quality and do not contain BPA. 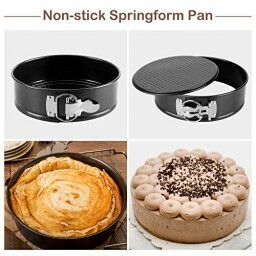 【Various Cooking Tools】 The 7-piece accessories set with Instant can provide you lots of uses,the steamer basket and egg steamer rack can be used to steam instant pot food,like vegetables, seafood, eggs, etc.When you use it to heat food it can remain the food original nutrients. 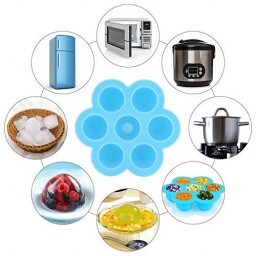 【Multipurpose Silicone Accessories】 The instant pot tool egg bites mold is made of high quality food grade silicone and do not contain BPA .You can use it for ice-cubes, finger foods, jellies, puddings, mini-muffins, cupcakes etc.